If you told me five years ago I’d be where I am today, living in the mountains, running my own business, completing four marathons...well, I’d think you were off your rocker. At the time I was living in New York City in my shoebox size apartment, working a 9–6 with a long commute on either end, making it work in a long-distance relationship, and squeezing in a workout when I could find the time. But yet, looking back, it’s easy to connect the dots and see that this is where I was meant to be all along. But the truth is, your vision may look nothing like mine, and I think that’s equally important to realize. Because the sooner you can hone in on what your own version of success and fulfillment is, the less likely you are to find yourself chasing someone else’s dream and start working toward your own—which, in case you haven't noticed, can be very easy to do in any industry, but especially the online world. Sometimes people think that vision boards are a little “out there” or “woo-woo.” But I think they’re actually far more grounded in reality than you might realize. I often find that people aren’t getting what they want in life because they don’t even KNOW what they want. And they certainly aren’t thinking about that vision daily and making small, consistent efforts toward it now. Seriously, think about it. When you've been super clear and took action on something, doesn't it almost always come to life? And friends, knowing what you want is actually a very GROUNDED concept, not to mention, it’s the first step to GETTING what you want. Visualization is just another tool to help you get there. Before we get into my updated vision board, I thought it’d be fun to share what a previous vision board looked like, because this stuff seriously WORKS. I had created this vision board a few years ago when I was starting to feel a bit like an umpa lumpa. The grind of running my own design business was starting to get to me and I was feeling the effects of no longer having to walk around the streets of New York to get EVERYWHERE I wanted to go. I DEFINITELY wasn’t getting my 10,000 steps in each day. In fact, if I’m being honest, it looked more like wake up --> and go straight to my computer. The way I was working didn’t feel sustainable. What’s the point of running a successful business, if I couldn’t ENJOY the effects of that? I had moved to Colorado and started my own business for the LIFE I would be able to have there, the outdoor activities I’d be able to enjoy, and I definitely wasn’t embracing it. It painted the picture of the lifestyle I would create for myself—more time outdoors, huddled around the campfire with friends, and waking up in a tent to that fresh mountain air. It included travel and no longer feeling tied to my desk by my business. It included more IN-PERSON connections with other creatives rather than just email. And perhaps the biggest lifestyle change—it included getting a dog, a companion to get me OUTSIDE more often for walks and keep me company during the day. I’m being honest when I tell you that EVERYTHING on this board has come to life. But what was the biggest shift that made this happen? My mindset. Vision boards really ask you to look at the bigger picture. It becomes more than just money and business (even though, those are important too!) and more about how your life and business are working together to create your OWN version of success. I’ll let you in on a little secret… The bigger vision you have for your life and business is actually a whole lot CLOSER than you might think. I’ve seen it over and over again, not only in working with clients, but in my own life too. The idea of a bigger vision can be intimidating, but when you actually break it down and refocus on what it is that you want for yourself, things become clearer. Now, I’ll be the first to point out that this is completely, totally, 100% AVAILABLE to me at this very moment. I am perfectly capable of driving to the store, buying tomatoes, mozzarella, and basil and making this salad. So what was stopping me from eating this way? I hadn’t really thought about it in this way before. I hadn’t considered that fresh and nourishing actually felt pretty darn luxurious to me. And once I did, it was a whole lot easier to solve for than never having thought about it at all. And your vision is likely the same. If you’re wanting a beautiful, balanced life and a thriving, successful business, I’d be willing to bet the action steps to get you there are a whole lot closer than you might think. One of the first images that I pulled for my vision board was a picture of a black house with white trim—one just like my own. On the patio sat a cute little dining table and chairs for two, complete with a french press and two mugs. Brian and I have talked about getting a table like this one for the front porch for ages, but it hadn’t happened yet because it hadn’t been a priority. And if I’m being honest, it wasn’t just about the table and chairs. It was about what that would create for us—more time outdoors enjoying the landscape, quality time together chatting in the morning, a new little cozy corner of our home. So when I pulled that image, I knew that was what I was envisioning. But I also knew that I didn’t want to spend a lot of time looking for the *perfect* dining set at the perfect pricepoint right now. I decided that I’d find it when the time was right—a bit of detachment, if you will. Well, that VERY SAME DAY, I happened upon the outdoor dining set of my dreams. On sale, down from $400 to a rather affordable $120 and I just KNEW it was coming home with me. What played to my advantage here? My point is that this visioning stuff REALLY works. And we’ve had blueberry pancakes and coffee on the patio to prove it. But it wasn’t only about the patio set—with that came the opportunity to spend quality time with each other in the morning (ticking yet another box on my vision board!). 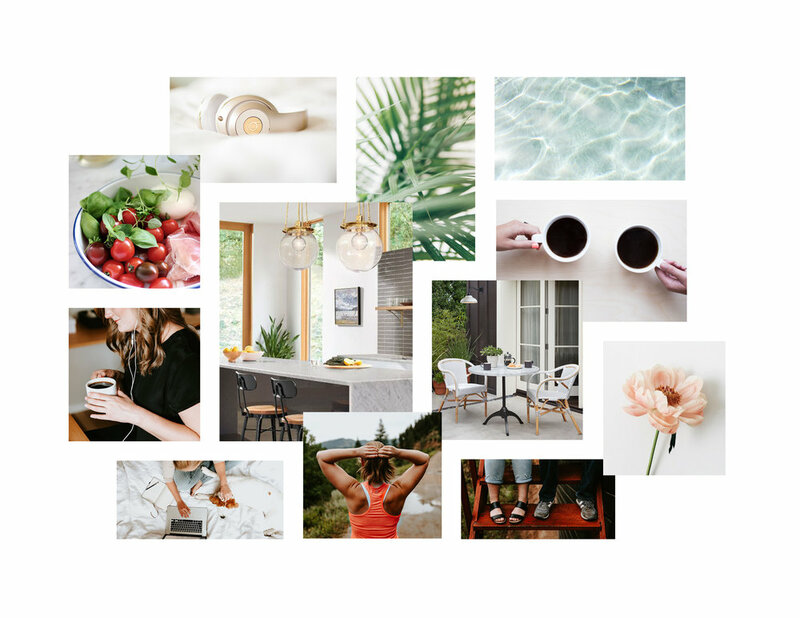 Vision boards aren’t as woo-woo as you think because knowing what you want is actually a very GROUNDED concept, not to mention the first step to GETTING what you want. Your vision for a beautiful, balanced life and thriving, successful business may look nothing like mine and that’s important to realize. The sooner you can hone in on what your own version of success and fulfillment is, the less likely you are to find yourself chasing someone else’s dream and start working toward your own. What's one thing you've visualized and brought to life (on purpose or accidentally in retrospect)?